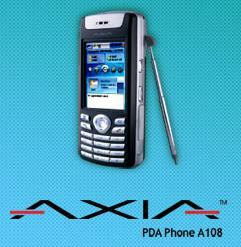 The true-blue Malaysian first PDA phone, AXIA A108 is gaining recognition and appreciation from abroad for its unique form factor. “AXIA’s key differentiator is in the design as a phone with full PDA features. It is the first phone-to-PDA in the world. The AXIA is targeted at creating the bridging segment between the voice centric Smartphone and the PDA-like data centric devices. To promote acceptance in the Middle East, the AXIA A108 is uniquely customized with user interface in Arabic. The significant achievement for SmartNet is that the Microsoft® Windows® CE 4.2 does not support Arabic language and yet SmartNet has successfully enabled the platform for Arabic input (including handwriting recognition) and output on the AXIA. Another first is the AXIA A108 will also be bundled with Pocket Islam application. Pocket Islam application is available only in English. SmartNet licensed Pocket Islam with Arabic support for the AXIA A108. Pocket Islam application is a full suite of Islamic content, that allows, amongst other features, auto audio narration of the Surahs at prayer-times.